Taittinger Nocturne Sec NV Champagne is an exciting and stylish cuvée from the Taittinger family, the easy drinking softness that a touch of sweetness brings makes this a perfect wine to enjoy late into the evening. Not quite as dry as Brut, but not sweet by any means, Nocturne is elegant and beautifully balanced, with soft, mellow orchard fruit characters and a lingering, elegant finish. 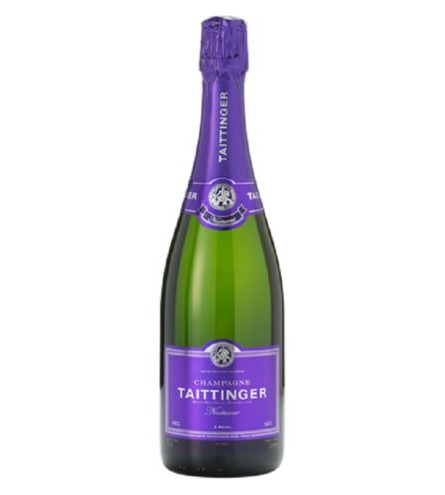 Taittinger Nocturne Sec NV is a pale yellow in colour with delicate fine bubbles its nose is subtle, fresh and reminiscent of white blossom and ripe fruit, with overtones of yellow peaches and dried apricots. On the palate it is soft, fresh and mellow with delicate floral and ripe fruit flavours. The aftertaste is long and soft with a subtle sweetness. All in all it is rounded, rich and well balanced, smooth and creamy. Taittinger Nocturne is a Champagne to be enjoyed at the end of an evening. It is the perfect accompaniment to dessert or foie gras and will gladly have Champagne lovers celebrating all night long. Taittinger Nocturne is a ‘Sec’ Champagne made from 40% Chardonnay and 60% Pinot Noir and Pinot Meunier. The finished blend includes over 30 ‘crus’. The wine is aged on its lees for at least 4 years, often longer, before being ‘disgorged’. A dosage of 17.5g of cane sugar per litre is then added. This dosage is twice that of Taittinger Brut Réserve NV. Taittinger remains one of the few Champagne Houses owned and managed by the family named on the label. Its origins date back to 1734 and the Taittinger link was established in 1931 when Pierre Taittinger acquired the House. Today, the Reims it is headed up by Pierre’s grandson, Pierre-Emmanual Taittinger and his son, Clovis and daughter Vitalie both of whom are actively involved in of this Champagne House. Taittinger’s home is situated above miles of chalk tunnels and cellars that are perfect for the slow ageing process required for great Champagne. The hallmark of the Taittinger Champagnes is the high percentage of Chardonnay used in their winemaking which can be anything from 40% in the Brut Réserve Non Vintage to 100% in the prestigious Comtes de Champagne Blanc de Blancs. This Chardonnay dominance provides for a style of elegance, delicacy and finesse that has earned the House many accolades over the years.